Physical Description:  p., col. ill., 26 cm. This nontraditional tribute uses the alphabet to organize a wealth of information about Lincoln's life and accomplishments. 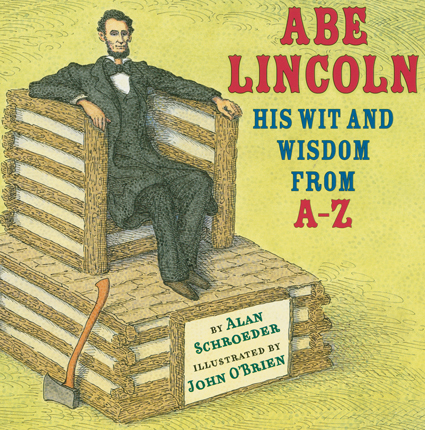 School Library Journal - 02/01/2015 Gr 3–6—This fun picture book offers an upbeat, alphabet book-style look at our 16th president. 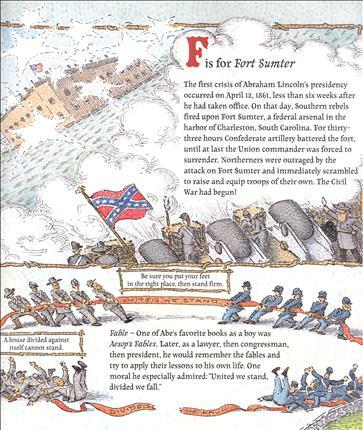 Along with historical facts about Abraham Lincoln and his times, modish and often comical pen and watercolor illustrations fill the pages of this book. For each leter of the alphabet, there are several related people or concepts; for instance, under M, Schroeder lists Lincoln's wife, Mary Todd, the Mexican War, and the word map (it's explained that Lincoln "tracked the Civil War's progress on a large map on his office wall"). Readers will learn fascinating facts about Lincoln's boyhood, his career as a lawyer and politician in Illinois, and his family. The presidential years focus on legislation signed by Lincoln, such as the Homestead Act and the Transcontinental Railroad Act. Though the Civil War is explored, there is little mention of specific battles. Inserted throughout are witty quotes attributed to Lincoln. Each page is brimming with text and drawings, and readers are sure to linger over the details. However, teachers and librarians should note that there are no citations or sources here, making it less than suitable for essays or reports. VERDICT A light and intriguing introduction to Lincoln, but stick with other sources when directing students to research.—Patricia Ann Owens, formerly with Illinois Eastern Community Colls., Mt. Carmel - Copyright 2015 Publishers Weekly, Library Journal and/or School Library Journal used with permission.